Time Deposits. I don’t even consider this as an investment, but for many Filipinos, this is the only thing they know about investing. Time Deposit is subject to a large percentage of tax and it can’t even beat inflation. Direct Stock Investment. By this I mean, directly (or by using a stock broker) buying shares of stock from companies that you personally pick. Studying companies to buy really involves a lot of research and you can’t simply leave it to a friend (or financial guru) to recommend which stocks to buy. Directly Purchasing Bonds. Similar to the above method, but this time you do it with bonds. What if the company is suddenly in financial trouble and defaults in their payments? There so much Credit Risks if you place your bet in only a handful of corporate bonds. The reasons why I don’t like these types of direct investments will become clear as we discuss the advantages of investing in mutual funds in the succeeding paragraphs. But just to make sure that we are on the same boat, let me give you a little background information about Mutual Funds. If you have been following this website for a long time, you should have learned these things by now. Mutual funds are investment companies that pools and manages money from different investors. Its basic building blocks include: corporate stocks, corporate bonds, government securities, money market instruments and commercial papers. Each mutual fund is organized as a corporation. When you invest in a mutual fund, you also become a part owner of the fund. Actually, the fund’s investors are also owners of common shares of the company. Mutual fund investors may either be individual persons (like you and me) or legal entities like organizations and corporations. Mutual Fund transactions are covered by the Anti-Money Laundering Act of the Philippines. Well, I could go on with my list, but these are the essential information every mutual fund investor — or those who want to be — should know. The above diagram shows the mutual fund investment process flow. As you can see, the profits of realized by the fund as a result of the investment is passed back to the investors, who are also the owners of the fund. That said, let us proceed to the advantages of investing in a mutual fund. Did you know that the Securities and Exchange Commission has set the minimum initial amount of investment in a mutual fund at only P 5,000? Indeed, there are mutual funds that you can invest in for as little as P 5,000 (roughly 150 USD) to start with. That’s even cheaper than opening a checking account in most banks. And, optionally — well you should, if you really want your money to grow — you can make additional investment with as low as P 1,000 (estimated at 25 USD). At FAMI, we are also able to serve a group of investors such as employees of a particular company to allow them to setup an investment fund for themselves for such goals as Retirement Funding or Provident Savings. We call this program as the Monthly Investment Program and it allows individuals to investment with as little as P 1,000 per month via salary deduction. Here is even more wonderful thing about mutual funds: Your money, no matter how small, becomes part of a larger pool of investments from various investors (both individuals and institutions). So whatever the big boys earn, you also earn an amount proportionate to your investment holdings. It’s like getting little pieces of the bigger pie. The smallest piece tastes the same as the entire pizza. “How soon can you get your money back in cold cash?” That’s one of the most important questions you should ask before you try to dip your money into an investment. Mutual funds are highly liquid investments. Meaning you can sell your shares at the fund’s published Net Asset Value at any time of the day. Your Mutual Fund company stands ready to buy back the shares that you want to unload or sell. They keyword there is “buy back”. Question: Can you give an example of an illiquid asset? How about real estate? Sorry, I have to spoon-feed you for the answer. reading the business papers every morning (instead of Facebook), etc. trading bonds and stocks if he deems it fit to do so. And some funds are even managed, not just by one fund manager, but by a team of managers. As an investor, you basically pick their brains and take advantage of the experience and expertise of your fund managers. Asset diversification is one of the greatest strengths of mutual funds. Diversification is a way of managing risk by spreading the investment into various assets. Buying stocks from different companies. Buying stocks from companies with different capitalization (small cap, mid cap and large cap). Buying stocks in different sectors (oil, financial, real estate, etc). Buying government bonds and corporate bonds with varying maturities. Take note: There are certain types of mutual funds that invest only in a very specific industry such as Real Estate or Mining or Technology. They are called Sector Funds and investing in them may not give you adequate diversification. What if the entire sector tumbles? Can you afford to take a beating? So watch out and always take time to read the prospectus. Through dividends in stocks and interests in bond. Through capital gains when the fund sells a security at a higher price. When the fund grows, thereby increasing its share price. The beauty about mutual funds is that any income realized by the fund over time can be used to buy even more securities (stocks or bonds). This is the power of compounding. This is money making even more money. This is how you can make a killing if you simply hold on to the fund in a much longer time. All these are working behind the scenes. As a mutual fund investor, you only get to see the effect of these earnings as they are reflected on the fund’s Net Asset Value per Share or NAVPS. Did you know that the interest your money earns in a time deposit is subject to a 20% tax? That is, if you have P 1 million in Time Deposit and the bank gives you 5% interest, after one year your money earns P 40,000 net instead of P 50,000. The P 10,000 difference, as you probably suspect, is withheld as tax on your interest earnings. Of course, that’s not an example of Capital Gains Tax, but just an illustration of how tax eats up your money. Perhaps the term is very familiar to those who have experienced selling or buying a piece of real estate. When selling real estate, you will be charged with Capital Gains tax that is based on the selling price of the property. At the time of this writing, capital gains tax is already at 6.5%. A Mutual Fund investment, on the other hand, is exempt from Capital Gains tax. Meaning, if at any point in time the fund earns 25% (not impossible) and you decide to take some profits by redeeming your shares, the 25% gain is all yours… tax-free. You normally get a good deal when buying stuff in large volumes compared to buying in smaller quantities. This is a good example of the principle of “Economies of Scale” at work. Scale simply means size, or volume, or amount, or quantity. The bigger, the cheaper. The same principle is at work when buying and selling shares of stock. Due to its size, Mutual Funds can negotiate the fees and charges (say brokerage commissions) when they buy or sell shares of stock or even bonds. This results in a reduced transaction cost, which then translates into savings on the part of the mutual fund investors. Now, here is a secret they never tell you in Stock Investment Seminars: The transaction cost (brokerage commissions) is higher when you trade (buy/sell) only a few shares of stocks compared trading larger quantities. In other words, if you only have a small amount of money to invest in stocks, the transaction cost alone would eat up on your investment! And besides, if your stock investment is really small, you are not really diversified enough. You might end up “swimming naked” when Stock Market goes south – and it happens from time to time. The Bottom Line – Let’s Talk About the Disadvantages, Too. 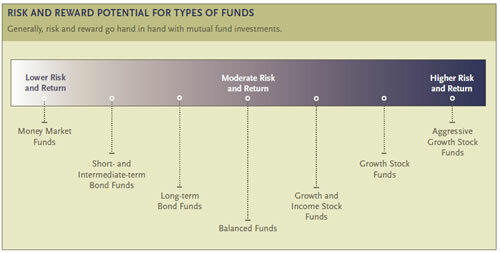 The risk and reward potential of the different types of Mutual Funds. I don’t want to fool you into thinking that Mutual Fund is the way to go when it comes to investing your money for the future. I don’t have any idea of your current financial situation. You have to take an honest look at yourself and really decide if it is for you. And that’s why I always suggest that you talk to a competent mutual fund representative before making the move, instead of just jumping into the water just like people do when they open a Time Deposit Account. Investors have varying risk profiles. Different types of mutual fund are designed to address different kinds of financial goals. The key is to match your investment profile with a certain type of mutual fund that can help you address your financial goal. Just like any kind of investment, mutual funds are not immune from Risks. Since mutual funds are nothing more than a combination of stocks, bonds and other securities, they are also subject to market fluctuations. But due to its diversified nature, mutual funds are better equipped to absorb those market shocks than any other investments. Here is also another disadvantage I’d like to point out: All the advantages that you see above, come at a price… they are not free. You must also pay your due when you invest in a mutual fund. Mutual Fund fees include: sales load (either entry fee or exit fee), management fee, marketing fee and penalties for early redemption of funds. Of course, Mutual Funds are not Charitable Institutions. (Even charitable organizations have expenses, too. Just ask Mother Teresa.) They incur expenses as a result of handling the funds, running their investments operations, and making your money grow. And if you have reached past the age of 20, you should understand that there is no such thing as a free lunch. In fact, you should be wary when someone offers you an investment that doesn’t cost anything. How are they going conduct their business operations? The good thing is, what you see reflected in your Statement of Account, which mutual fund companies send out quarterly, is already net of expenses. If, for example, at the end of the year, you realized a fund increase of 19.25%, the fund expenses are already taken from that report. That is your Capital Gain — or Profit, if that is how you want to call it. And, since mutual funds DON’T have Capital Gains Tax, that money is all yours for the taking and it is automatically reinvested in the fund! You think that mutual funds are good investments? Whatever your answer is, make sure it is supported by intelligent reasoning and factual information in order for it to make sense. The video presentation above summarizes the whole article. If you missed any part of the article, this video shows you the finer points of the discussion.